It's likely this will remain the budget option for the foreseeable future - a little bit more of a price drop and we'll be a lot more impressed with this otherwise decent handset. The Nokia Lumia 710 is the second offering into the Windows Phone arena from Nokia, following the release of the Nokia Lumia 800 late last year. The first thing you notice when comparing the Nokia Lumia 710 with its older mobile phone sibling is that the Nokia Lumia 710 looks and feels cheaper. And it is. 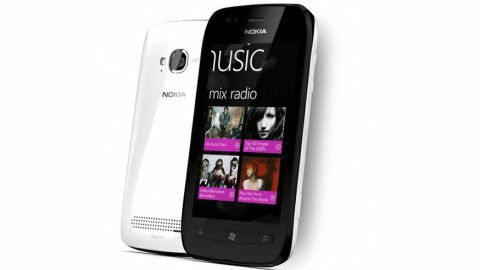 Where the Nokia Lumia 800 SIM-free price is around £430, the Nokia Lumia 710 is expected to cost a somewhat more economical £300. The reason the Nokia Lumia 710 feels like a cheaper handset is partly down to the weight, coming in at a sprightly 125.5g against the Nokia Lumia 800's 142g. On paper this seems like a good thing, but the smartphone is too light somehow, making it feel unsubstantial compared to its bigger brother. In addition to this, the Nokia Lumia 710 screen is recessed slightly, and the transition from the front face of the phone to the sides feels quite angular. The result of this styling is that the phone design doesn't look or feel as coherent as the Nokia Lumia 800. Also we found the separate physical buttons for Back, Home and Search on the Nokia Lumia 710 look and feel cheaper than the integral styling on the Nokia Lumia 800, and we caught the bottom left of the screen when going to press the Back button a number of times. One major advantage over the Nokia Lumia 800 is that the rear cover is removable, since the Nokia Lumia 710 comes with a replaceable battery. Based on the battery life of the Nokia Lumia 800, the ability to carry a spare battery and swap out may well prove extremely useful. With the Nokia Lumia 710, Nokia has returned to the days of the changeable covers - rear at least - to further personalise your mobile phone. Although we're all for changeable covers and phone personalisation, removing the cover feels like something we should be doing as little as possible when we saw the exposed pads onto which the side buttons press. Although phones with changeable covers are more commonly marketed at younger users, the only available payment method for Vodafone and T-Mobile customers is by credit card, which many won't have. This seems odd since Microsoft enabled PayPal as a payment method on the Xbox 360 late last year, and those transitioning from Symbian handsets are used to having the option to pay via their phone bill. It seems that at present, if you are interested in buying a Windows Phone, then you're best off with Orange, which is supporting pay via phone bill with Microsoft. When we compared the size of the Nokia Lumia 710 (119 x 62.4 x 12.48mm) with the Nokia Lumia 800 (116.5 x 61.2 x 12.1mm), we were surprised to find it was the larger of the two. The only reason we could find for this was the extra mechanics required for a removable cover and replaceable battery in the Nokia Lumia 710. The Nokia Lumia 710 and Nokia Lumia 800 share the same screen size (3.7 inches) and resolution (480 x 800p), although the Nokia Lumia 710 is limited to a ClearBlack TFT compared to the ClearBlack AMOLED on the Nokia Lumia 800. They also both use Gorilla Glass, making them somewhat bomb-proof. The similarities continue to the processor, with both phones using the 1.4GHz single-core Qualcomm MSM8255T Scorpion/Snapdragon chip. Outside of the Nokia stable of handsets, the Lumia 710 is similar to the HTC Radar, which is 11.5g heavier, at 137g, although similarly sized, measuring 120.5 x 61.5 x 10.9mm. Both phones have a 5MP camera and 8GB of internal memory. But the HTC Radar has a slightly larger 3.8-inch screen and a substantially lower powered processor - a 1GHz single-core Qualcomm MSM8255 Scorpion/Snapdragon.